PT Garuda Indonesia (Persero) Tbk - Garuda Indonesia (IDX : GIAA) or referred to as "Garuda Indonesia Group" is the national airline company of Indonesia and is majority owned by the Government of Indonesia. At present, the Government of Indonesia is the majority shareholder at Garuda Indonesia Group, with 60.51% of ownership. Other remaining 39.49% shares was owned by public. Headquartered in Soekarno–Hatta International Airport Cengkareng (near Jakarta), Garuda Indonesia Group runs its business through 180 fleets (as at the end of August 2015). Its fleets include 137 Garuda's main board fleets, and 43 Citilink's fleets. In term of financial performance, Garuda Indonesia Group has shown significant performance improvements in the first half of 2015 (1H 2015, ended in 30 June 2015). 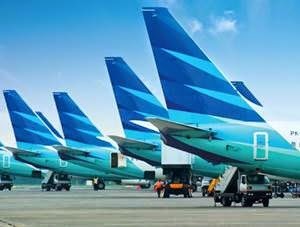 According to PT Garuda Indonesia (Persero) Tbk Corporate Presentation September 2015 as cited by JobsCDC.com, the Airline company booked total net income of US$29.3 millions in 1H 2015. This reflected an 114.5% increase from loss US$201.3 millions in the same perido previous year (1H 2104). Garuda Indonesia Group’s total revenue as of June 2015 reached US$1,840.1 millions, an increase of 4.7% as compared toUS$1,756.9 millions in June 2014. Minimum S1 from any field, preferably majoring in Industrial Engineering, IT, Supply Chain, Management, Economics Accounting from a reputable university. The candidate with prior experience minimum of 1 year in the related field is preferred. Expertise with computer and information system applications, minimum Microsoft Office and Internet. Minimum D3 majoring in Secretary, Office Administration. The candidate with prior experience minimum of 1 year as secretary is preferred. Fresh graduate candidate from Secretary major are welcome to apply. Computer literate, minimum Microsoft Office and Internet. Willing to participate in the selection process at Jakarta. JobsCDC.com now available on android device. Download now on Google Play here. Please be aware of recruitment fraud. The entire stage of this selection process is free of charge. PT Garuda Indonesia (Persero) Tbk - D3, S1 Fresh Graduate, Experienced Staff Garuda April 2016 will never ask for fees or upfront payments for any purposes during the recruitment process such as transportation and accommodation.